HCM City (VNA) – Representatives from foreign-invested (FDI) enterprises in Ho Chi Minh City contributed their ideas and recommendations to spur growth in the city at a meeting with municipal leaders on March 23. 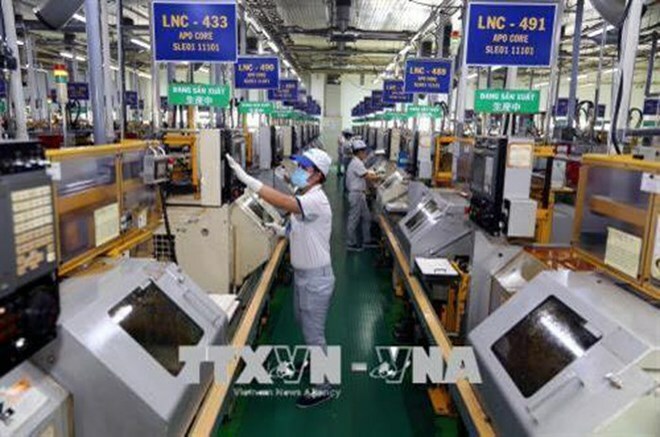 Secretary of the city’s Party Committee Nguyen Thien Nhan hailed the development of the FDI sector in the city, which has become one of the growth drivers for the city. He reported that 1.55 billion USD had been poured into HCM City in the first three months of 2019, up 20.4 percent from the same period last year. The official said the new trend of technological development and globalisation has required the city’s administration to reform its management in order to create a favourable environment for business activities and innovation. Chairwoman of the American Chamber of Commerce in Vietnam (AmCham) Amanda Rasmussen said at the meeting that HCM City has made progress in facilitating business activities and goods circulation. However, she said the frequent change of laws and regulations, including taxation policies and tax rates, is causing difficulties to foreign investors, as it affects their business and investment plans. Vice Chairman of the European Chamber of Commerce in Vietnam (EuroCham) Tomaso Andreaatta affirmed that HCM City is an attractive destination for foreign investors, including those from Europe. However, to achieve a breakthrough in growth and foreign investment attraction, the city should accelerate infrastructure projects and take effective flood control measures along with improving public transport. Andreaatta added that as European investors pay great attention to the environment, HCM City should set up a body to manage the discharge of waste water in industrial parks and propose the Government issue policies on air quality and public transport development, thus ensuring a clean living environment for the city’s residents and foreign investors. Carlos Dominguez Agulleiro, deputy head of the Economic and Commercial Office of Spain in HCM City, said an increasing number of Spanish enterprises are making the decision to invest in Vietnam. If in the past they were attracted to the country by the low labour cost, now they choose the country based on high growth, stable macroeconomic foundation and a clear policy on global cooperation. At the same time, he pointed to existing hurdles to the flow on investment into HCM City, including a lack of transparency of procedures, which causes delay and uncertainty for enterprises and investment projects. In addition, delayed transport projects have affected the pace of many investment projects, and the lack of suitable infrastructure has remarkably reduced the competitiveness of Vietnam in general and HCM City in particular. Chairman of the municipal People’s Committee Nguyen Thanh Phong appreciated the recommendations of the foreign business community, and stressed that the city always considers the FDI sector an important part of the local economy and attaches importance to promoting the sector’s long-term development. According to the official, the city is now home to more than 8,000 FDI projects with total registered capital of nearly 45 billion USD. With an average 20 billion USD of export revenue each year, the FDI sector accounts for 58.7 percent of the city’s total export value. The sector is employing 670,000 workers and creating indirect employment for millions of others.